Just type "Apachie friends" from google search engine then click search. note: you can choose old version of xampp. 2.then choose for windows if your using windows operating system. note: click start in order to run Apache & Mysql. note: just open another mozilla browser, then type http://localhost and press enter. Automatically you redirected to xampp server. 18. Click Security in order to put username & password for your server. 19. note: input first for mysql root password. note: follow other instruction base from the image. 20.after, click password changing button. 21. Second put username & password for your xampp directory. Before you can write php code, be sure that you have finished installed notepad2/dreamweaver on your windows operating system. Third, Save your first php script. Open Internet Explorer/Mozilla Browser, then type http://localhost/hello_world.php and press enter. 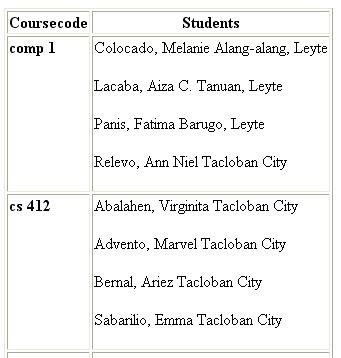 Try this code by copy then paste it to your .html or .php extension file type. note: You can modify this code. // Check each input in the order that it appears in the form! Using php code, you can get data from mysql database then put the data inside your option value. This can be useful sometimes if you need to put data base from mysql database, then put value to your combo box. After creating php script for image/photo upload, you can search photo base from info. Create folder name: images inside htdocs before you can create upload photo. First, all images file will be uploaded to the images folder. Second, path info. will be save on the database mysql. - Sample to display data from mysql database using html table to your php file. 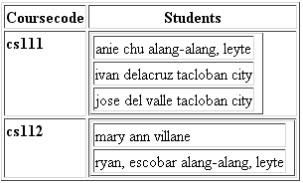 The purpose of this code is to save record on studentinfo and studentlist table in your MySql database in one click of your add entry. Confirmation if the specific record was already existed in the mysql database the php code will not continue to save data. On another side, if specific data was not yet inside the database the program will execute to save a data. Save data from html form to MySql Database. 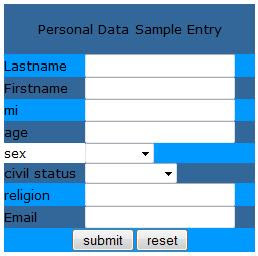 Again, here is a sample html form for data entry and php script. Before you will decide to save data from html form to MySql database. Much better if you will put first a validation control. Then after clicking submit button, you can add php code to POST or REQUEST data on the save.php file. It's up to you if you will only display the data, or save the data to MySql Database.